62 SMT Magazine • October 2015 A significant change to the soldering as- sembly specifications is outlined in the recently released "F" version of the J-STD-001, Require- ments for Soldered Electrical and Electronic Assem- blies (July 2014) for gold-plated components. With the advent of more information from studies on the behavior of how much gold can impact the mechanical structure of the solder joint, the "washing away" of gold has become more important. 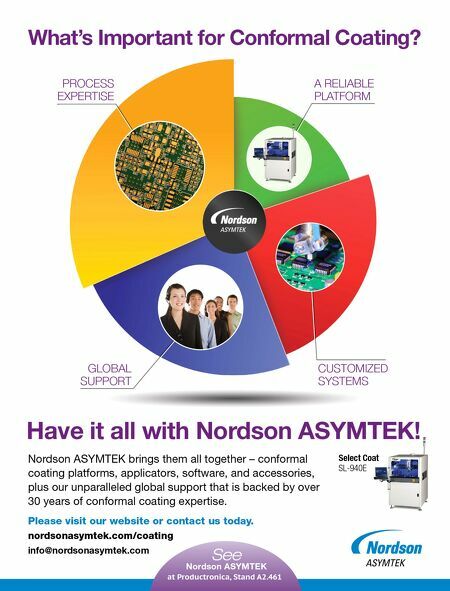 Gold is widely used in electronic package finish designs in order to enhance solderabil- ity and wire bondability. A thick, pure gold finish (Figure 1) can be used to enhance wire bondability, but can be too thick for soldering, causing solder joint embrittlement. It does not oxidize very readily, melts at relatively low tem- perature, and dissolves rapidly in the soldering process. However, too much remnant gold in the solder joint can weaken the integrity of the interconnection. 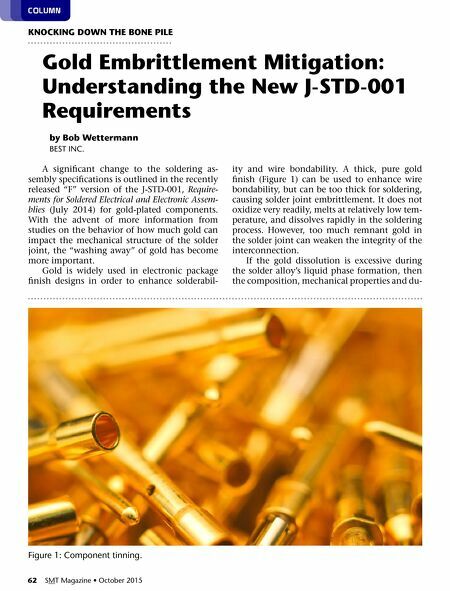 If the gold dissolution is excessive during the solder alloy's liquid phase formation, then the composition, mechanical properties and du- COluMn by bob Wettermann BeST inc. KnocKInG doWn the bone PILe Gold embrittlement Mitigation: understanding the new J-Std-001 requirements figure 1: component tinning.